Stuff Points: Earn 546 points when you buy this stuff. 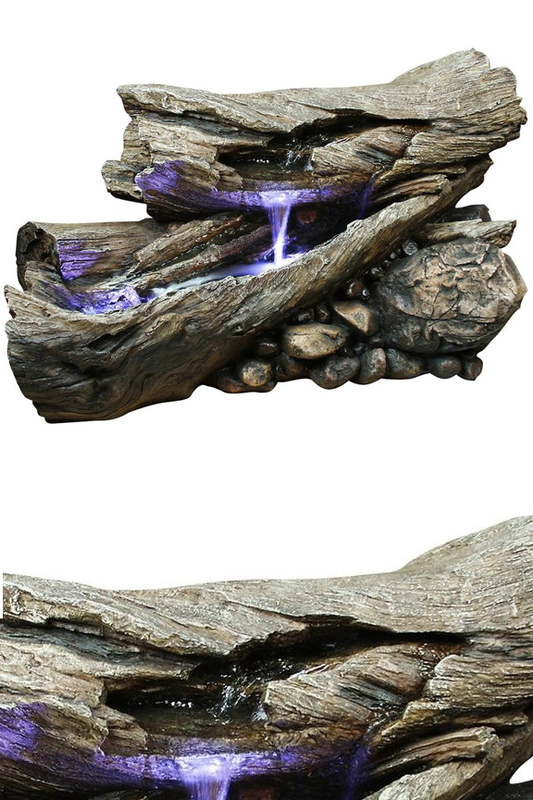 If you could pick up a section of forest, and place it in your backyard, it would look just like this fountain. 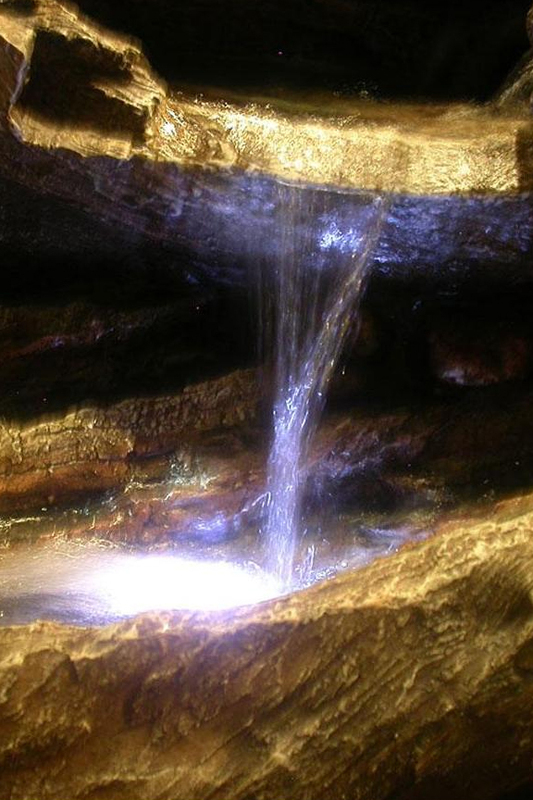 A busted, old tree sits decaying on a pile of rocks, and it becomes home to a lively stream of illuminated water that's perfect for any yard. The wood is propped at the ideal angle, and the intricate detail ensures it will enhance any space, and blend well with existing foliage and decor. Water will pump to the top of the fountain to fill the top piece of wood. Once a pool forms, a waterfall will begin to flow out of an opening on the side. From there, it will drop down into the larger section of log in order to flow over the gentle rapids, and fill the deeper pool at the end. Underwater lights will enhance the look of the wood and water, and it will also help to create mood lighting that improves nighttime ambiance. The horizontal style, and large size makes it perfect for blending into your existing landscaping, but it also works well as a bold, stand alone focal point for use right next to a deck or patio. It looks like it was crafted using actual wood sourced from the rain forest, but it's actually molded from a durable and lightweight resin that gives the same look at a fraction of the cost and weight. The incredible detail makes it look just like nature intended, but the poly-resin material is actually more durable and long lasting than the real thing. It comes complete with everything you need to make it run, and setting it up is incredibly easy. The high quality pump guarantees performance, and a one year warranty provides piece of mind. Use indoors or out to enhance any space, set the mood, and block out unwanted noise by replacing it with the soothing sounds of natural running water. Simple Set-Up. This outdoor fountain ships complete with everything necessary set it up, and it requires little to no assembly. Just fill it with water, and plug it into any regular outlet to complete the installation process. Poly-Resin Construction. The durable material looks like wood and rocks, but it's much lighter, far less expensive, and it doesn't make any kind of mess. High Quality. Incredible detail make it look like nature intended, and the top quality electronics that come paired with it, guarantee proper function for years to come. Extra Long.Most fountains are vertical, but this one has a horizontal design. Water flows from one side to the other as it cascades over gentle rapids. Indoors Or Out. The material is durable, so use it inside or out. Integrated Lights. Underwater LED lights illuminate the stream, and enhance detailing in the wood. It also improves visual appeal in low light settings. This model is 24 inches tall, and 40 inches wide on it's longest side. This fountain is much longer than most, so the horizontal scene will work best on the ground outside, but you could also use it on the floor inside as well. Blend with your garden and landscaping for a realistic water feature. A long log is home to a lively stream that would enhance any yard. Integrated lighting and realistic details make it perfect for any space. Order Yours Today! A Decorative Indoor/Outdoor Fountain With Island Flare. Old Growth Trees Form Multiple Pools For Water To Flow. With LED Lighting. A Fun Design That Will Add Charm To Any Backyard. Use Indoors or Out.